In 1990, at the age of 20, I moved to New York City and got a job as the tape room guy for Warner/Chappell Music Publishing. It was a small office, about 12 people, but the door to one room was always closed. I assumed it was unused. He was in the previously-closed room, door open, fighting with the typewriter. I went in to help, and as I was fixing it, I noticed some press clippings on the wall about Sammy Cahn, then looked at the man and realized it was Sammy Cahn! 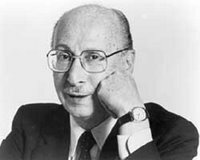 Legendary songwriter Sammy Cahn who wrote most of those huge Frank Sinatra hits! “Love and Marriage”, “Let It Snow, Let It Snow, Let It Snow”, “All the Way”, “High Hopes”, “Call Me Irresponsible” and many more. He lived in Los Angeles, but they kept a New York office for him, which he’d visit every few months. I fixed his typewriter, then said, “Sammy — my name’s Derek. If you ever need anything, just buzz number 12 on your phone and I’ll be glad to help.” He scowled at me, then waved me out of his room. But from them on, every time he’d come into town, I’d be the first to know, because his voice would bark over my intercom, “[beeeep] Derek, goddamn it, get in here!” Everyone else at the office avoided him. One day, he had me go to the Time/Warner Cafeteria to get him his favorite bowl of soup. When I gave it to him, he yelled at me for not filling the cup all the way to the top. One day, he had me get some Ben Gay from the drug store. When I gave it to him, he asked me to rub it on his neck, which I did, but I used too much, and he yelled at me for making his neck all goopy. But I liked him. His cranky personality was like a running joke, and didn’t bother me a bit. He was still writing songs every day. Usually custom lyrics for existing songs, tailored for friends’ birthdays or special events. But he was still writing new songs, too. I’d find an excuse to be in the room when he was writing new songs with composers like Walter Afanasieff. I played him some of my songs, and he gave me advice. I was thrilled. 20 years old, living in New York City, and working with Sammy Cahn. He looked at me, and his usually-scowling face went blank. Like the mask he always wears had dropped. Like he hadn’t heard “I like you” in a long long time. Then he went back to yelling at the coffee machine. A few months later, in November 1992, I quit my job to be a full time musician, and went out to an isolated part of the Oregon coast to record. No TV, no newspaper, no internet, no radio. Just me, all alone, just recording. Warner/Chappell Music was long behind me, and I didn’t keep in touch with anyone. Every morning I’d wake up with no alarm clock, and remember all of my dreams. I started writing them down. The more I wrote, the more I remembered. Sometimes it would take 45 minutes just to write down all the vivid details. One Friday in January, I had this vivid dream that I was outside a big military building in the 1950s. A mounted air force jet outside, and General MacArthur was at the door. We talked for a minute, then he let me in. I walked down a long empty hallway, then took a right, and walked down another long empty hallway. The same night I had the dream. I didn’t believe in any of that stuff before, but couldn’t help but wonder about that life-after-death stuff you hear about, or maybe ESP, or something. Who knows if I had the dream right before he died or right after, but I still think he came by to say thank you.